CommonWealth Magazine's 2014 survey of Taiwan's top 2,000 enterprises revealed a clear trend: instead of trying to get bigger, companies are now determined to get better. Say goodbye to the era when a company's scale of operations was all that mattered. Taiwanese enterprises are now facing a paradigm shift in how they manage their businesses. Less than a decade ago, the private sector was still worshipping "Genghis Khan-style" conquest of market share, scale and territory, but today, highly focused and skilled "hidden champions" have emerged as the pacesetters. How should companies address this paradigm shift in business models? For a broader perspective, this year's CommonWealth Magazine Top 2000 Survey looked back at the past to get a bead on the future. It scoured data from the magazine's Top 1000 Company surveys over the past 30 years (the magazine began surveying the top 2,000 companies in 2013) to track when the new benchmark enterprises were born, and to decipher their secrets of success. Of the top 100 domestic manufacturers in the CommonWealth Top 1000 Survey in 1994, only 44 are still at the top 20 years later, and turnover in the service sector was even more dramatic, with only 36 of the top 100 enterprises surviving the test of time. Twenty years ago, the information technology and electronics sector was taking off, but while its surge was reflected in the list of Taiwan's top 100 manufacturers, IT and electronics enterprises occupied fewer than half of the top 100 spots. Of the leading 100 service enterprises, only seven were IT companies. The top 10 enterprises back then were still dominated by old-economy players and especially the car industry, with Hotai Motor, Ford Lio Ho Motor, Sanyang Industry, Kuozui Motors, CMC Motor, and Nanyang Motors all ranked among the top 10 manufacturers or service providers. 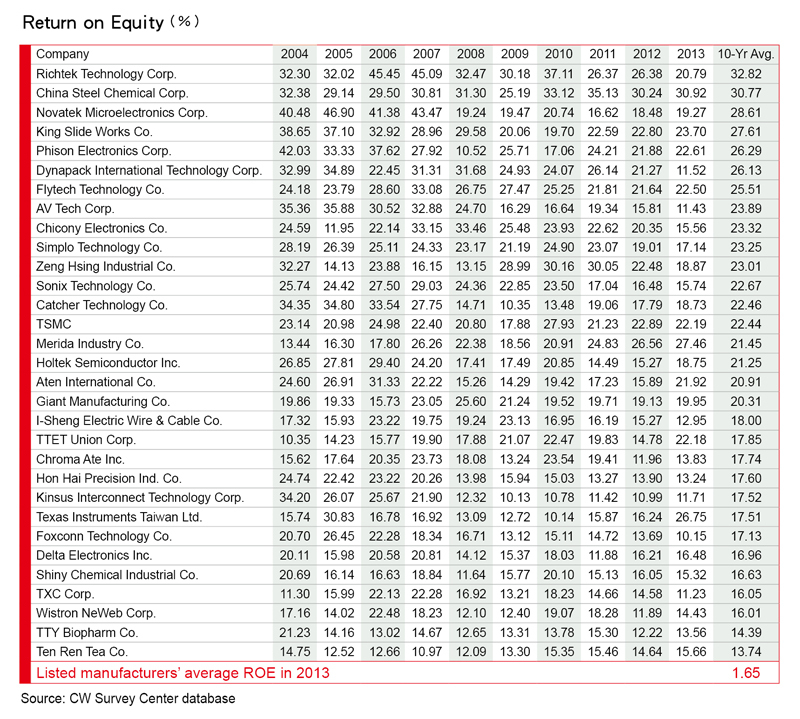 Taiwan Semiconductor Manufacturing Co. (TSMC), still categorized at the time as an electronics company, ranked as the 35th biggest manufacturer, while Compal Electronics and Quanta Computer had just catapulted into the top 100 for the first time that year. As for Hon Hai Precision Industry, it ranked a mere 143rd among manufacturers, with revenues of NT$3.9 billion. It would have been hard to imagine then that just 20 years later, Hon Hai would be the world's largest contract electronics manufacturer and Taiwan's biggest privately owned manufacturer, with annual revenues of NT$327.6 billion, or that Quanta, TSMC, Compal, BenQ Corp., Acer and MediaTek would have supplanted the once-big car companies in the top 10 lists. But a closer look at the latest rankings, which are based on 2013 results, shows that after more than a decade of IT and electronics companies dominating Taiwan's corporate landscape, subtle hints of another seismic shift have emerged. Even if more than half of this year's top 100 are from the high-tech sector and Taiwan's "big five" electronics contractors – Hon Hai, Quanta, Compal, Pegatron Corp. and Wistron Corp. – remain among the top 10 manufacturers, the reality is that electronics giants such as Hon Hai, Quanta, flat panel maker Innolux Corp. and smartphone vendor HTC Corp. have all begun to see their revenues flatten out or even decline. Taiwan Institute of Economic Research vice president Kung Ming-hsinexplains that Taiwan's IT sector has made a habit of entrenching itself in the supply chains of whatever the hot global sector is at the time and jumping on opportunities to secure big orders. Though entailing less risk, "this survival philosophy can make companies rise up quickly and fall just as quickly," Kung says. The potential fall Kung was referring to comes from the threat of being squeezed out by China's domestic supply chains. "Anybody competing with China on size and volume will not have any opportunities over the next 10 years," says Frank Wang, founder of Athena Capital Management, who has seen several companies rise and fall during his career. "We are now at a critical juncture where the focus on quantity is shifting to an emphasis on unique competencies." 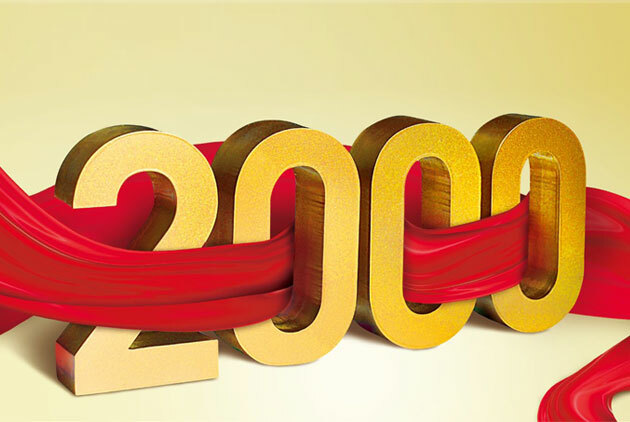 This year's Top 2000 Survey yielded several signals highlighting that transition. 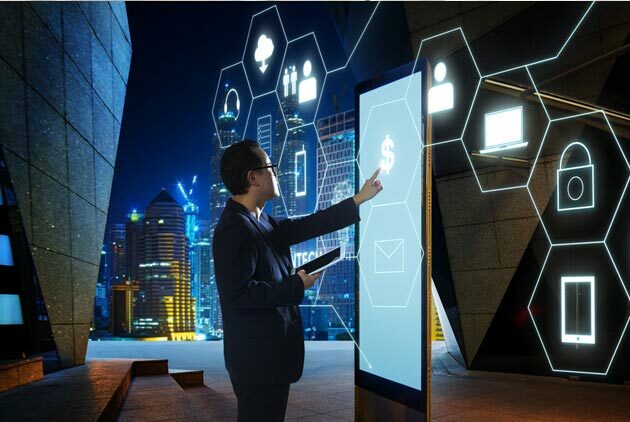 Companies whose revenues sustained double-digit growth last year, from TSMC, MediaTek and Catcher Technology in the high-tech sector to old-economy stalwartChang Chun Group, all focus on maximizing specific technologies. The best example of this single-minded approach is smartphone camera lens maker Largan Precision, which made headlines on May 6 when its shares closed at NT$2,000, shattering the Taiwan stock exchange's previous closing high of NT$1,975 set in 1989 by Cathay Life Insurance Co. The paradigm shift changing Taiwan's industrial landscape can be seen in Largan's meteoric rise. If each year's stock price king is the stock that spent the longest time on the throne during the year, then only 9 companies have been declared stock price kings over the past 20 years, and only MediaTek, Largan and HTC have won the honor at least three times. Charles Hsiao, president of Fubon Securities Investment Services, observes that the three companies all developed new products quickly enough to keep up with their changing industries, and, even more importantly, were committed to excellenceby putting the highest priority on innovation within their respective fields. 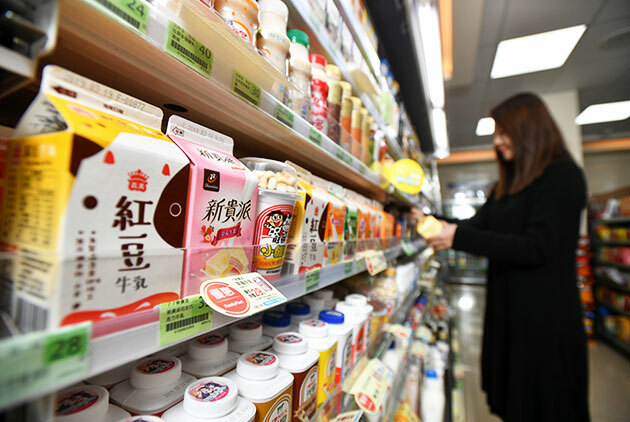 Largan is perhaps Taiwan's best example of a "hidden champion," a relatively small and inconspicuous company that is among the top three in the world in its market. The relatively low-profile Largan cracked CommonWealth's top 1000 rankings for the first time in 2003, a year after it went public, ranking 628th with annual revenues of NT$1.8 billion. In the 2014 survey, Largan had catapulted to 125th on revenues of NT$27.4 billion, with revenue growth last year of 36 percent. Barring a major surprise, the camera lens maker should make its way into the top 100 next year. But to Largan, specialization and mastery of a technology has been far more important to its success than the scale of its operations. 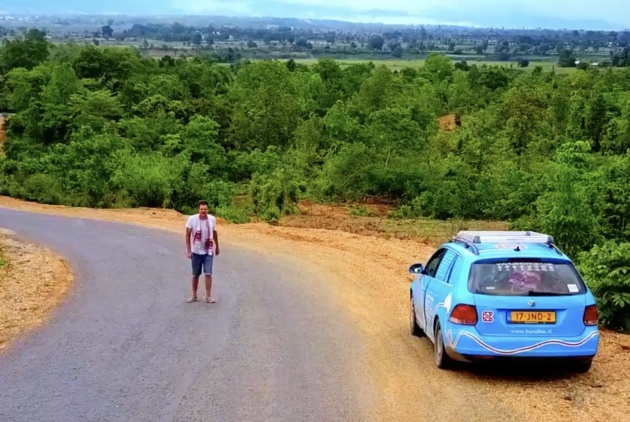 That was evident even 12 years ago when one of Largan's founders and then-president Tony Chen took a CommonWealth reporter around the company's factory in Dongguan in southern China. Chen was making an extremely rare public appearance because Largan had just gone public. The tall and thin Chen rarely volunteered anything of his own accord, and even when asked a question, his answers were simple and concise. Exuding the persona of a rigorous technician, he is a hands-on leader. Entering the factory, one quickly discovered how fastidious Largan is in keeping its production environment spotless. Simply going from the cutting area to the coating department required three changes of shoes. With every change, Chen bent down and helped neatly place the CommonWealth reporter's shoes in a cabinet, and he was just as meticulous when hanging up his cleanroom suit. Chen revealed at the time that when Largan decided to get involved with plastic lenses, it bought a super high precision non-spherical plexiglass injection molding machine from Japan. After the Japanese engineer finished installing the machine in Largan's factory, Chen said he spent a month getting familiar with the machine's functions and settings. What was left unsaid is that Chen not only mastered the machine, but actually made alterations to it. "Do you know why Largan is so formidable?" asks Hiwin Technologies Corp. chairman Eric Y.T. Chuo. "They design and develop all of their equipment, so even if others poach Largan's talent, they still won't learn Largan's secrets." Hon Hai was still relatively unknown 20 years ago when it was on the cusp of success, and CommonWealth sought to identify other companies in this year's Top 2000 survey that are now poised to shine as Hon Hai was then. 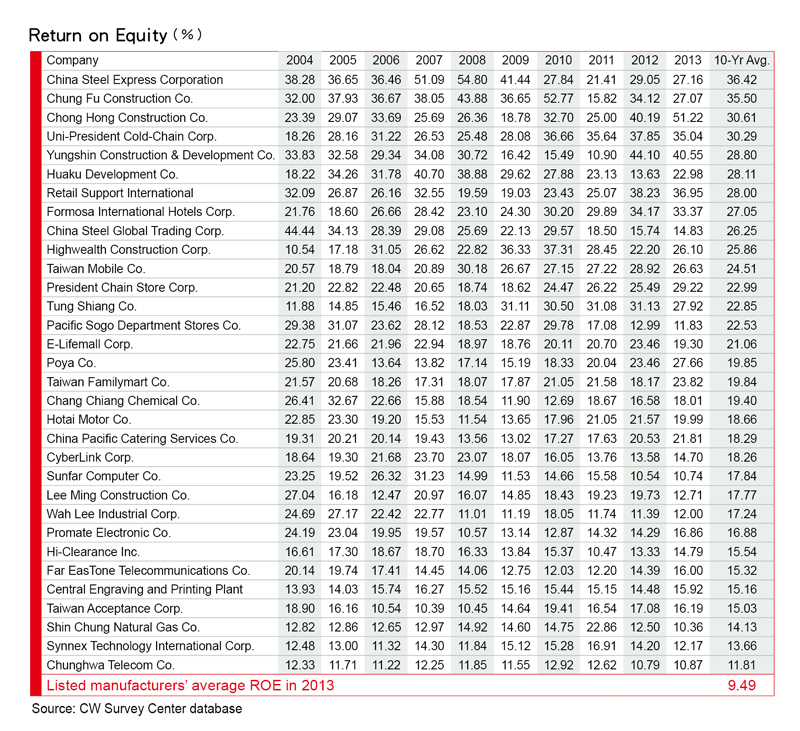 Pinpointing return on equity (ROE) as the best indicator of excellence, we identified those companies with double-digit ROE 10 years in a row,"Taiwan's Most Dynamic Enterprises" that are both excellentand robust. Lee Ji-ren, a professor in National Taiwan University's College of Management, explains that ROE integrates three main components – net margin, asset turnover and financial leverage – reflecting a company's ability to generate profits, run its business and make the best use of its finances. "If a company has an ROE of 20 percent, it is usually seen as a pretty good company," Lee says. The information technology and electronics sector has traditionally been more likely to generate high ROEs, but the more recent shrinking of profits and narrowing of margins in the sector have put a stranglehold on net margin – the first component of the ROE formula and the one most able to drive ROE higher. Add to that the asset-heavy nature of many Taiwanese companies and their generally conservative approach to financial management, and Lee's standard for "pretty good" suddenly becomes a pipe dream for most enterprises. 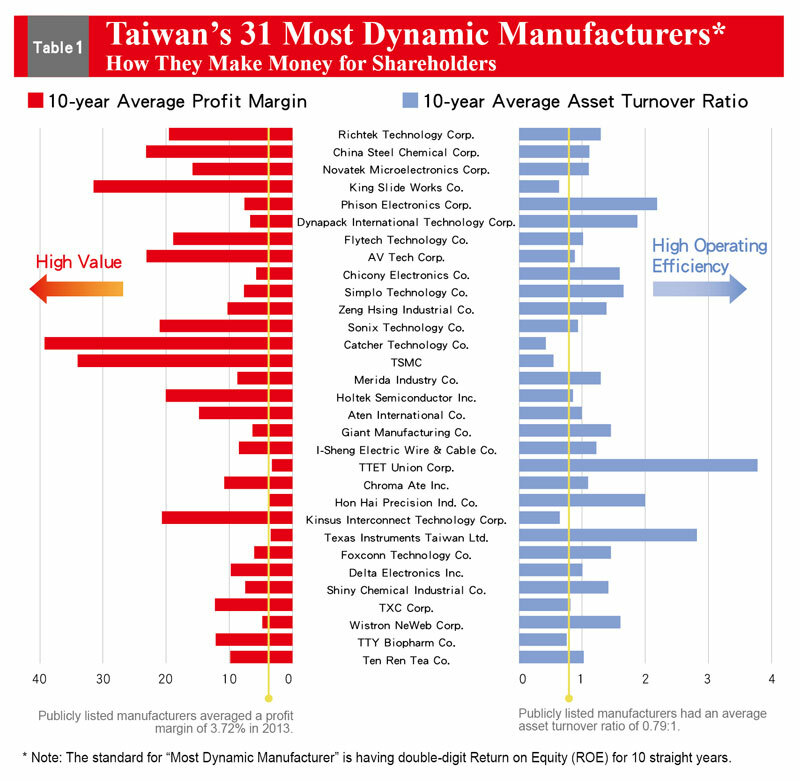 Among all companies listed in Taiwan, manufacturers averaged a return on equity of just 1.65 percent in 2013, while service sector companies averaged 9.49 percent. The list of "dynamic enterprises" selected because of their consistently high ROEs reveals that they are not restricted to small companies. 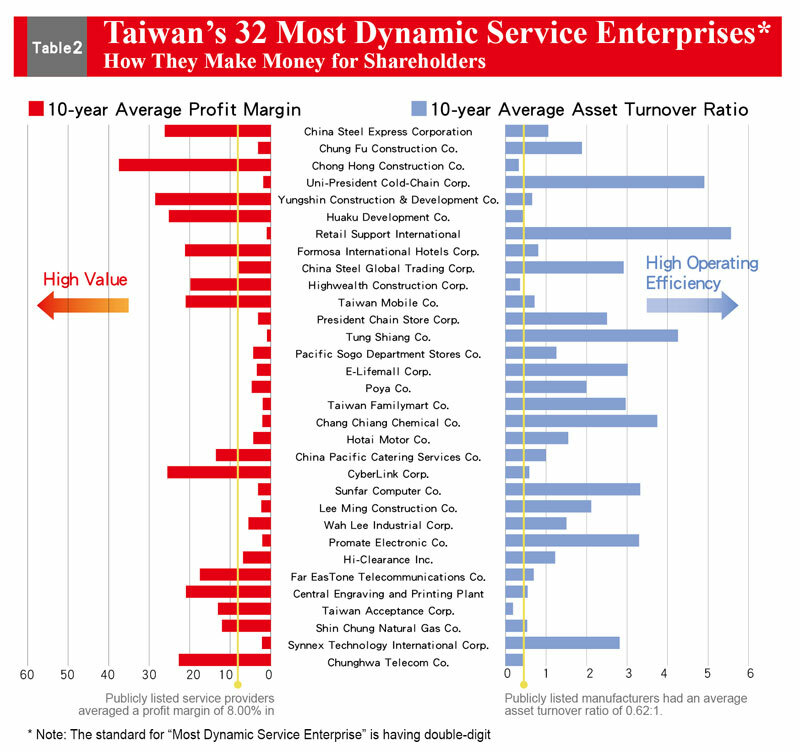 In fact, the two enterprises with the highest total assets in Taiwan – Hon Hai and TSMC – were both on the list. A closer analysis of the data reveals that TSMC, which has averaged an ROE of 34 percent over the past 10 years, has built its business on outstanding products and high value-added services. As for Hon Hai, though its profit margin has only averaged 3.8 percent during those same 10 years, it has been highly successfully in converting assets into sales, thus generating high asset turnover (calculated as revenue/assets). This deft high-volume approach illustrates the excellence behind Hon Hai's massive size. Hon Hai's total assets of NT$2.3 trillion are roughly double those of TSMC, but the company "turned them over" into revenues of NT$3.9 billion in 2013, roughly 6.6 times TSMC's sales. Yet Hon Hai's sales in 2013 stagnated for the first time in 20 years (excluding 2009 when the global financial crisis hit), growing an anemic 1.2 percent. The company's ROE fell to 13.2 percent last year, down from 24.7 percent 10 years ago. Even if Hon Hai chairman Terry Gou refuses to publicly acknowledge his empire's limits, the group's aggressive initiative to spur entrepreneurship by spinning off some of its divisions into independent "cash cows" shows it is well aware of the trend toward excellence and away from volume. Similar operational capabilities are evident in the services sector. 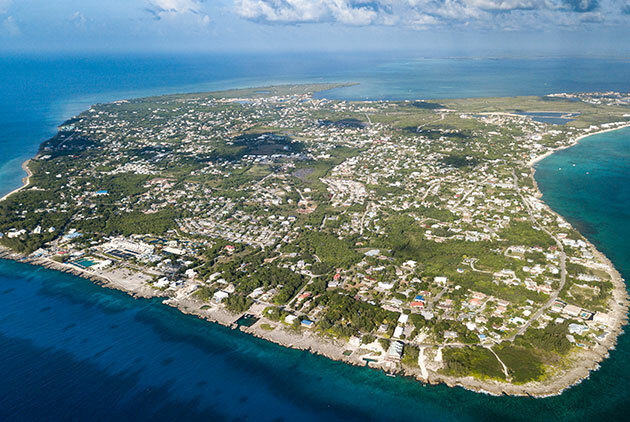 Retailing giant President Chain Store Corp., which operates the 7-Eleven convenience store chain, has only managed an average profit margin of 3.2 percent over the past 10 years because of the nature of its business. But its average asset turnover ratio of 2.5 has underpinned its consistently strong ROE. There is no way to project for sure which companies will be the new benchmarks in 10 years' time, but what appears clear is that the "era of excellence" has arrived.